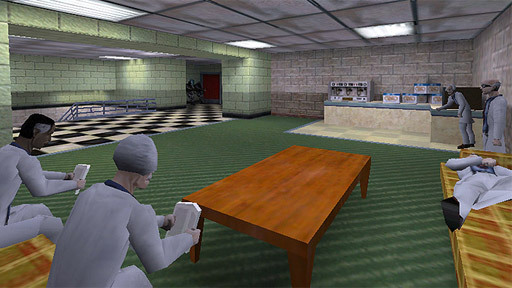 All video game levels (especially first person shooters) are like these sets in a number of ways: designers decorate their levels with fake doors and windows, hallways that don't go anywhere -- even in the design terminology, we see levels in terms of props, actors, lights, the AI "Director" in the Left 4 Dead series... but this element of artifice seems to disappear when you become "immersed" in the game. Many will argue that this "immersion" comes from a photorealistic visual fidelity in the world, but this logic would fall under the "immersive fallacy" as outlined by Katie Salen and Eric Zimmerman. But I guess that's a post for another time. So seeing "backstage" reminds you that the set isn't real. It's like Brecht's alienation, I suppose. Or at least that's what I got out of it. 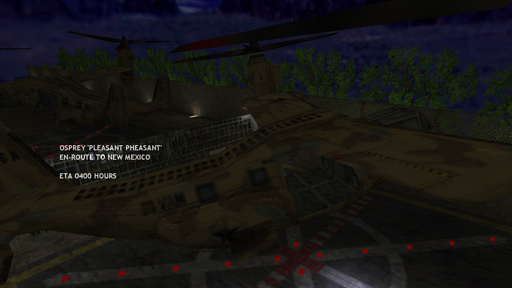 Then sometime later, he made "Bootleg Squadrog," almost certainly the greatest Half-Life: Opposing Force mod ever released. Rather, it's all NPC scripting on an absurd level, and it completes the illusion that you're all soldiers in the same unit, watching this ballet of squad movements swirl along the hallway. The writing is pretty chuckle-worthy too. Why aren't there more "funny" games? There's Double Fine games, the Telltale games, and some indie developers. No one else to my knowledge. Totally an untapped market. 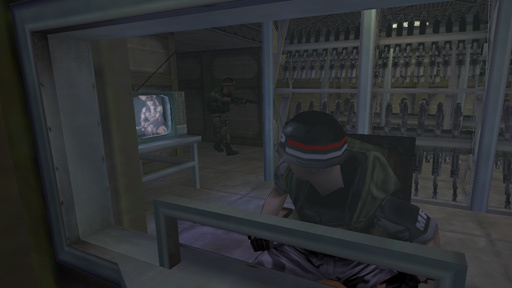 But I'd say the best part in BS is when halfway through the mission, the lights in the complex go out -- and you hear a symphony of those distinctive clicks: your fellow squad members' nightvision goggles turning on. It's such a small, simple touch (literally, a multi_manager entity triggering 6 or 7 ambient_generic entities, perhaps 5 minutes of work) but the effect is profound: the NPCs have logically responded to a change in the world state. And that's the ingenuity that every modder should aspire to, the ability to achieve something so huge with so few resources. No / little new code. No / few new models. Just... good design, working within the constraints. Small touches like that remind me of blinding Alyx with your flashlight in Half-Life 2: Episode One -- it makes absolute sense, and it makes you wonder how many times you blinded Alyx in Half-Life 2 without her reacting, how any FPS video game ever got by without implementing something so logical. 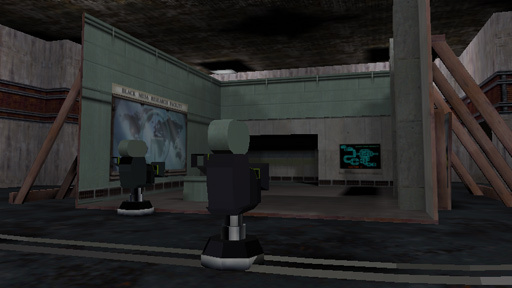 It represents a step towards bridging the much more daunting uncanny valley of NPC behavior. "Arctic Chimp." 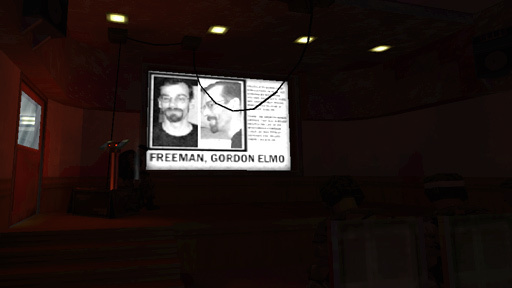 "Gordon Elmo Freeman." "Pleasant Pheasant." An MP watching Xena. Too often, in discussing writing narrative for games, we forget about tone. We only think about plot and character -- but it isn't just what you say, but surely how you say it? They say tone and body language form 70% / some other high made-up percentage of in-person communication. Brendon Chung's mods remind us that writing is where we, as modders (and indie developers), can beat the big boys. The big boys have to manage 100,000 lines of voice acting; they're getting too big for their britches. The result? Jim Raynor saying "everyone's a critic" and my head exploding in shame-pity. We need to focus on character development, tone and strong in-game setpieces to differentiate ourselves from the bland tripe that's designed by investors and marketing. And most of all, we have to keep it small and doable. Modders and indies need voice, is what I took away from these mods, and Brendon has it in spades. Go forth, young prince of quirky first person shooters. I salute thee. Next time: Bugstompers and The Puppy Years.